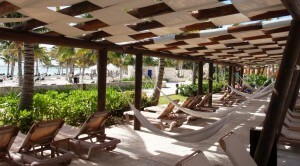 Luxurious guestrooms and a dizzying selection of dining experiences await at the Barcelo Maya Palace Deluxe. 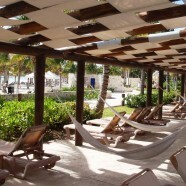 Located midway between Playa Del Carmen and Xelha, Barcelo Maya Palace Deluxe is the crown jewel of the Barcelo Maya Beach Resort complex. This luxurious all-inclusive property has the best of both worlds: the peaceful ambience of a boutique five-star resort with the perks of a megaresort close at hand. The main lobby is decorated with a cosmopolitan chic aesthetic reminiscent of Miami’s South Beach, providing many areas to mingle or sit back and relax. Lobby terraces and balconies are furnished with trendy yet inviting seating, and the nearby lounge, Carey’s, is the spot for a relaxed cocktail. Clients looking for a livelier venue during the day can visit Coco’s bar by the pool, where Latin and club music set the tone. 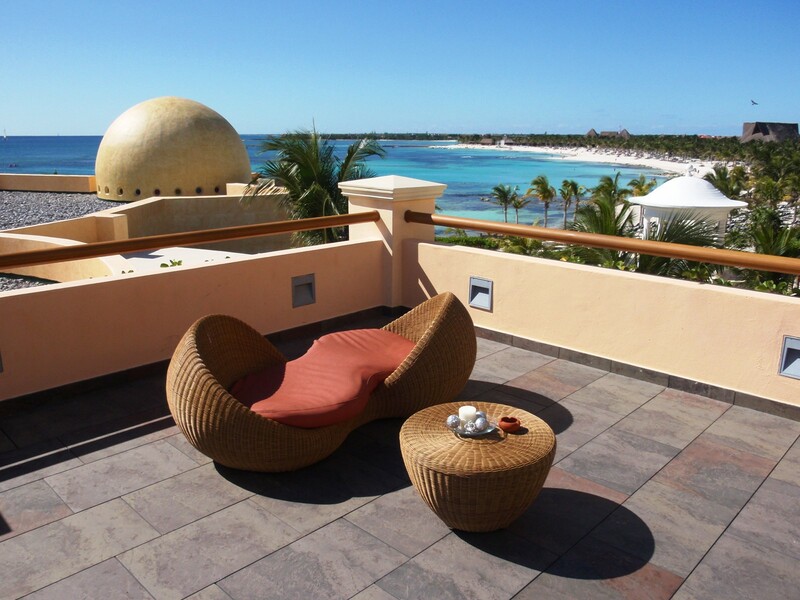 First impressions are very important, particularly with well-traveled luxury clientele, and clients will note that even the standard rooms at Maya Palace are spacious and lavishly appointed. Spanish colonial arches and columns are complemented with dark wood and rattan island interiors. Furnishings are refreshingly simple but draped in warm reds and earth tones, while artwork and wall hangings are an eclectic blend of modern rustic and contemporary design. Perhaps the most impressive part of the standard suite is the bathroom, which includes a full bathtub, an adjoining shower with a natural rain shower head and two large onyx bowl sinks, accented with granite masonry. 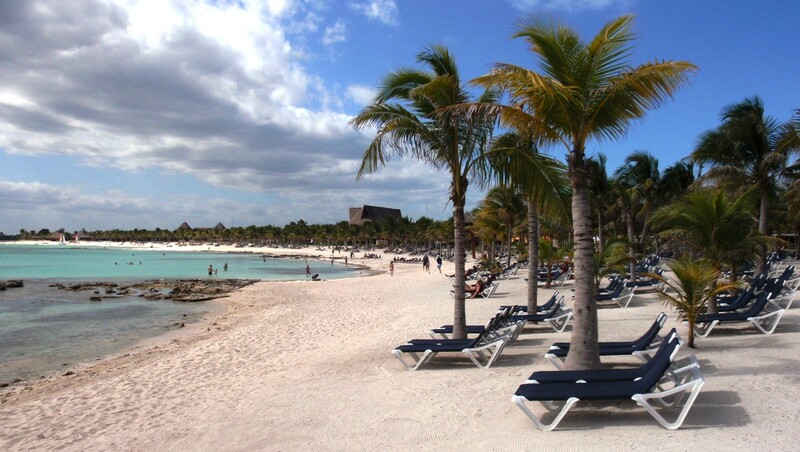 Guests of Maya Palace have a variety of beach and hotel facilities at their disposal, including pools and a fun kids’ mini-water park. 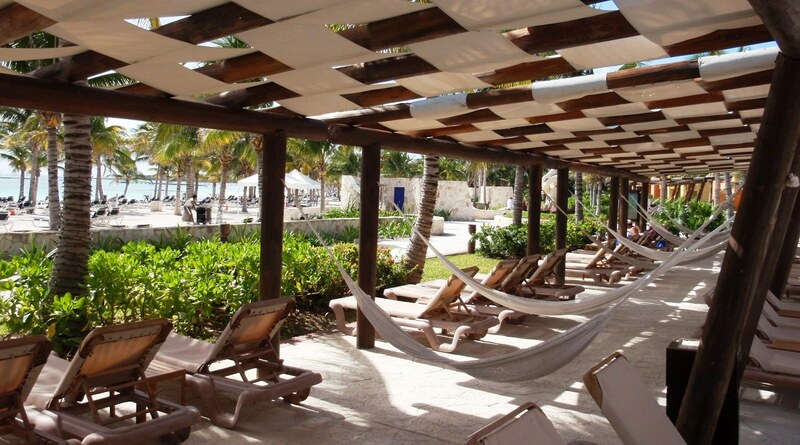 In addition to on-site amenities at the resort, clients also have access to the dining options, beach and common area facilities and amenities of each of the other four resorts that make up the Barcelo Maya Beach Resort. A courtesy shuttle makes the rounds every 20 minutes, and the walk is manageable. Maya Palace offers a high-tech, luxuriously appointed theater for nightly live performances and Vegas-style shows with a decidedly Latin flavor. The seating arrangements are comfortable and intimate — each set of two or four plush chairs comes with its own full-size table. The productions are quite lavish and often have the feel of Broadway. For many clients, the variety and quality of dining offerings are a very important deciding factor when choosing an all-inclusive resort. The number of dining venues is astounding at this five-hotel resort complex. Maya Palace’s specialty dining alternatives are truly special. Dinner at the French restaurant, La Brasserie, for example, starts out with artisan breads and features starters such as terrine of foi gras, fine escargots and classic French onion soup. Main course highlights include chateaubriand, lobster, duck and filet mignon — all available without an additional surcharge. Notably, Barcelo provides full bar service in all of its buffets and restaurants, allowing guests to order their preferred beverage with their meals. It is evident that Barcelo has pulled out all the stops to deliver a superlative guest experience at Maya Palace. Without reservation, this resort is one of my top recommendations for an all-inclusive experience in the Riviera Maya. • Offer clients Club Premium access. This new concept in services and facilities in the Premium guestroom categories gives guests a VIP reception, champagne or petit fours upon arrival, personalized attention and more. • Advise clients to specifically ask for the teppanyaki grill-side table when booking the Kyoto specialty restaurant. Otherwise, they may be disappointed when seated at a regular table and miss the show. The menu is the same in either seating but, for many, the show is an experience not to be missed. • When booking your clients’ day tours, consider private tour options that can leave earlier in the day to arrive at the popular sights and ruins well ahead of the crowds and heat. Arriving at Chichen Itza by 9:30 a.m., for example, requires a 7 a.m. departure. • Taxi rides are almost twice as expensive from the airport to the resorts than on the return (about $120 versus $70), so make sure your clients book a transfer with your preferred supplier, at least for the arrival. First published in TravelAge West magazine, August 22, 2011.